NotesIn9 | Lotusphere thoughts and some announcements. Lotusphere thoughts and some announcements. I had a great Lotusphere. Though I wouldn’t have known it from the beginning as I was sick, and I mean REALLY sick on the Saturday I traveled, but luckily by Sunday I started feeling human and got ready for the week. Tuesday night was SpeedGeeking. That was more difficult then I remembered. 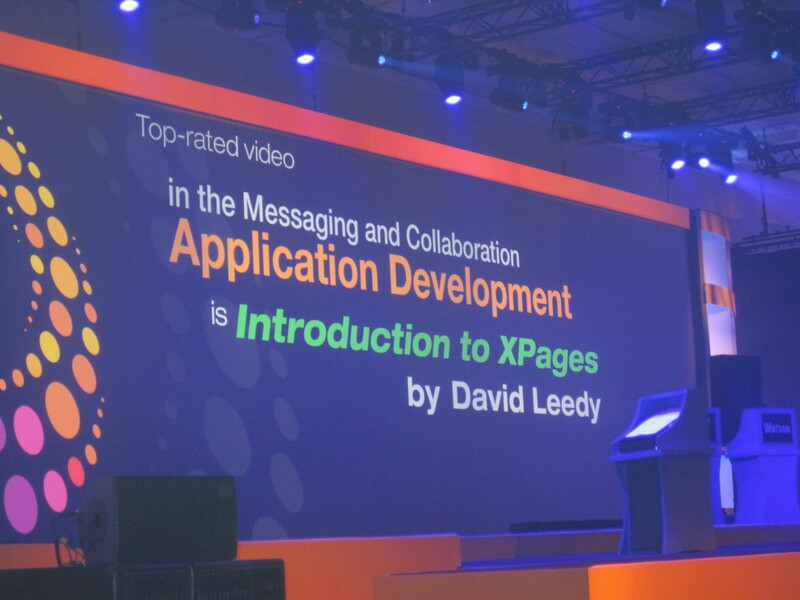 I talked about XPages and why you should care about it. Many demos dealing with Repeat Controls, Binding, and Rendering. It was fun but man that does take a lot out of you. I think the biggest surprise for me was the response that I got from the XPages Cheat Sheet that I compiled. I did not expect such a great response at all. Joyce Davis was going to print 1,000 and ended up printing 1,500. And honestly I thought she was nuts. 🙂 But my understanding is they were almost all gone by the end of the show. Tim Clark and Matt White had them in their PACKED Show and Tell Session. At the end of the session I was talking to someone sitting next to me and just barely noticed that an awful lot of people were going to the front to see the speakers. I remember thinking that was odd to have so many questions after a Tim and Matt session. But it turns out there was a bit of a “rush” to the front to get a hold of the Cheat Sheets!!! Wow! Tim then had this funny quote that Joyce tweeted later. I’m very happy that people seemed to like it and I hope it helps in XPage Development!! The next really cool thing was at the closing general session. I had sent my Introduction to XPages video into VideoFest and it won for the best Video in the App Dev category. Wow! It was even on the big screen and everything! So while Watson may have won on Jeopardy, I feel like I won at Lotusphere. 1. I’m desperate to get back to NotesIn9 shows. I’ve got a couple of hopefully really good ones queued up and just need to finish them. So stay tuned for that. 2. Next week I’ll be presenting on XPages for IDoSphere. I’ll blog more about that tomorrow. 3. I’m going to start working on something for openNTF. I hope to have a project there soon. This is in addition to the demo app from our session that Paul and I plan to put on openNTF. 4. Paul and I are planning to do our entire session as a NotesIn9 Extended Edition. It’ll actually be more like a Directors cut as I’ll add a demo in the end on the Extension Library. So thanks to everyone for a great Lotusphere, and thanks for the interest in the stuff I create. I really appreciate it!